Senegalese fishermen are desperate and are warning the world that a civil war and a famine are just around the corner. Many of them are now considering piracy as a last resort. This is a serious warning to the European Union and West African governments. We are robbing the poorest regions of the world from their only source of protein. Despite fishing licenses that have been given out, and ridiculous fishing agreements that have been made with the EU, all foreign commercial fishing activities have to be halted immediately in order to prevent a civil war. Senegalese fishermen are giving a clear warning; If we don’t stop fishing now all hell will break loose soon. Overfishing in West-Africa has now reached the point that local people are unable to find themselves enough protein. While Chinese trawlers are catching the last remaining fish in West-African waters, they are selling their catch back to Africans for huge prizes. On top of Chinese plundering there is the European trawler fleet which is catching unbelievable amounts of fish. 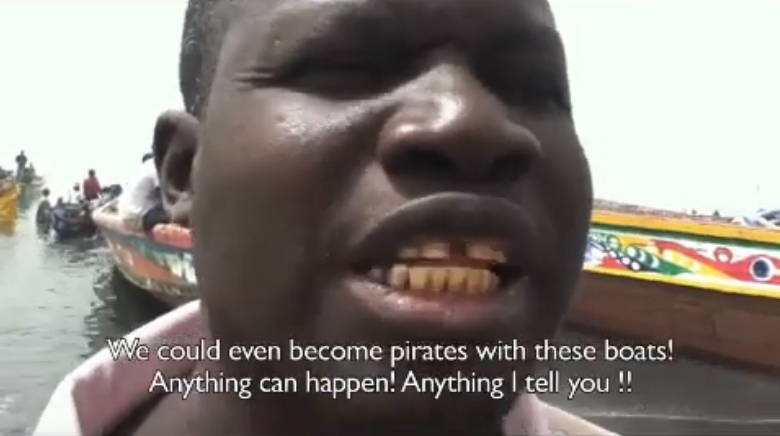 Senegalese fishermen are desperate and are considering piracy as a last resort. We have seen the same development many years ago in Somalia. Because of piracy fish stocks were able to restore themselves. The catches of West African fishermen have declined to almost no fish nowadays and they are now warning. This out of control overfishing has to be stopped now if we want to prevent piracy, famine, a civil war in Senegal and prevent millions of refugees. The Senegalese fishermen claim that the stability of their nation is at stake. They are warning that a civil war and a famine are just around the corner. If nothing is done shortly to stop overfishing by European Union and the West African governments, a famine in unavoidable. All the African fish stocks are depleting incredibly fast. There are many fishmeal factories that are processing unbelievable amounts of fish daily. Fishmeal factories are the main cause of why the Sardinella or Bonga fish is now disappearing from West African waters. Because there is no sustainable fishing, the species is at the brink of extinction now. Believe it or not but some of these young people were arrested by the Gambian Armed Forces and locked up for speaking out for their environment. Sardinella is extremely vital for the health of Africans. The fish (locally sold as Bonga Fish) used to be the only affordable source of protein for many poor people living in the coastal communities. Now the fish is unaffordable and the health of many people is at risk. Senegalese fishermen say that the outbreak of a civil war is not unlikely. Let’s not forget that the EU and China are robbing the poorest region on the planet. They are having nice stories about how their high-tech ships are fishing sustainable. About their ‘sustainable’ fishing agreements with African nations or leading to a better future. This is all nonsense. The EU made a deal the Gambia in which the country sells it’s tuna for 136 Euro per ton, while the same tuna is traded within the EU for 1290 Euro per ton. There is no such thing as fishing sustainable with boats that catch thousands of tonnes of fish per day. This madness has to end now, or the Senegalese fishermen will end it. That is a promise. Until the foreign fishmeal factories started (mostly owned by Chinese companies) operating along the West African coast, Sardinella Fish was to be found everywhere. A cheap source of protein, often smoked to transport inland to feed the poor. Take a look in Golden Lead Fishmeal factory in Gunjur, the Gambia. This is just a moment of one day. 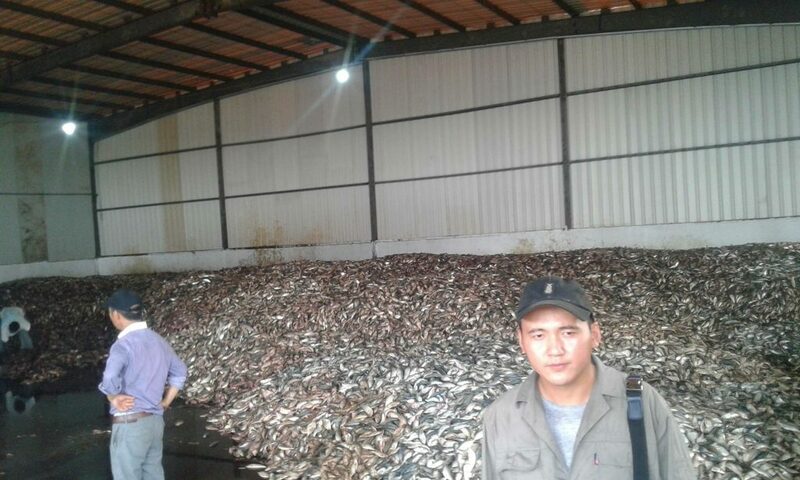 Imagine every day this amount of fish is taken away. Sardinella is a fish that is rich in oil. This is the reason that Africans that are living along the coast are proven to be more healthy then people living more inland. Young children, pregnant and lactating women are particularly at risk now the Sardinella has become unaffordable for many. The amount of fishmeal factories that are operating along the African coastline is everything but sustainable. A small country like The Gambia only has 48 km of coastline. Within a 14-kilometer radius three fishmeal factories are operating. A fourth one is being build. 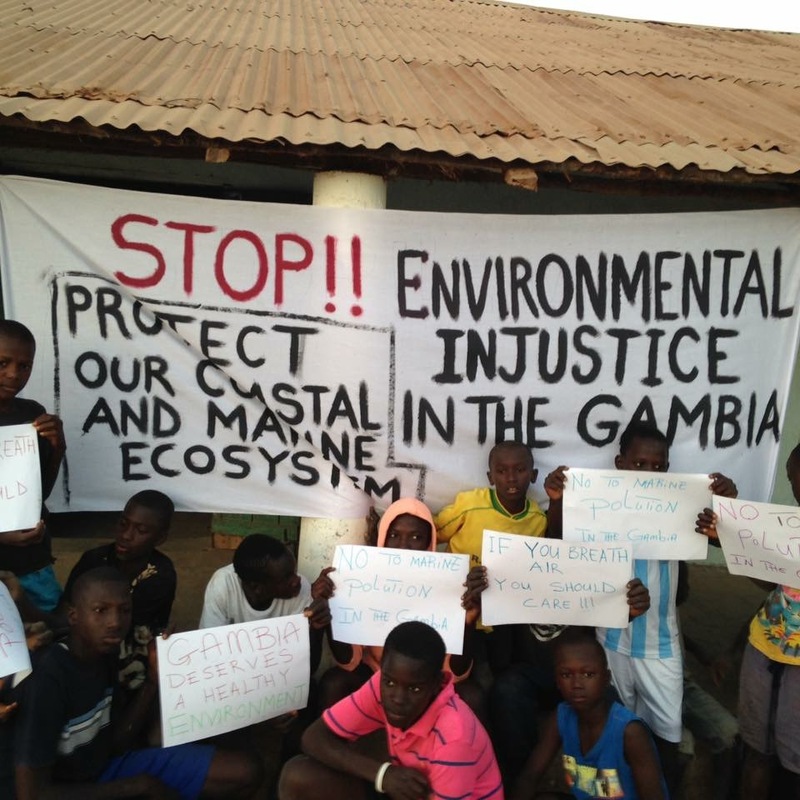 Chinese investors rise their flag to provoke local environmentalists while installing their new illegal pipeline at Gunjur Beach in the Gambia. There are a few foreign companies, mostly Chinese, who are basically exporting all the region’s protein straight back China. Fishmeal factories are making unbelievable profits because the demand for fishmeal to feed farmed pigs, chickens, salmons and shrimps is higher than it has ever been. None of these profits flow back to the local community. Local villages expected a lot of new jobs and that the money would flow back into their community. None of this happened. In fact only a few people found jobs, but in bad conditions. While the Chinese are working in their protected suits, African workers are often found to be working without protective clothing. Local fishermen are selling their fish for cheaper prizes to the fishmeal factories. Often they are catching loads of baby fish. Just to keep feeding the factories mouth. This undersized fish is not always accepted because there is a risk for the factory in getting caught for violations. As a result the fish is send back and by the fishermen taken back into the sea and thrown overboard. This happened a lot in the Gambia and resulted and miles of beaches covered in dead fish. The fact that so much undersized fish has been caught to supply the fishmeal factories is worrying. If generations of fish are taken away this early it is impossible for the fish stocks to stay healthy. This is exactly what happened the passed years because there is totally no control in what these factories are processing and how much fish is caught. The fish stocks are expected to collapse completely by 2019. In the proces to transform the fish into fishmeal a lat of waste water is produced. To get rid of this waste water the factories installed pipelines into the ocean. The results where that wildlife started to die and a local wildlife reserve got poisoned by the Golden Lead Fishmeal Factory in Gunjur. We received over 80 reports in 2018 over dead whales, dolphins, massive amounts of turtles and fish eating sea birds on Gambia’s beaches only. We are convinced there is a direct relation to the dumpings of arsenic waste water. This never happened before the Chinese were here. The Factory is by far the biggest threat for the people living in Gunjur, the Gambia. Besides the fact that their vital source of protein is taken away, their environment is polluted. Their Bolong Fenyo Wildlife Reserve, turned red when it was poisoned by the arsenic laden waste water form the Golden Lead Factory. the soluble form of Arsenic was 55ug/L, an aberration of 138% above average. This dangerous level of very potent carcinogen being pumped at an industrial scale into fish landing site in Kartong, Gunjur and Sanyang on daily bases is too dangerous to continue. 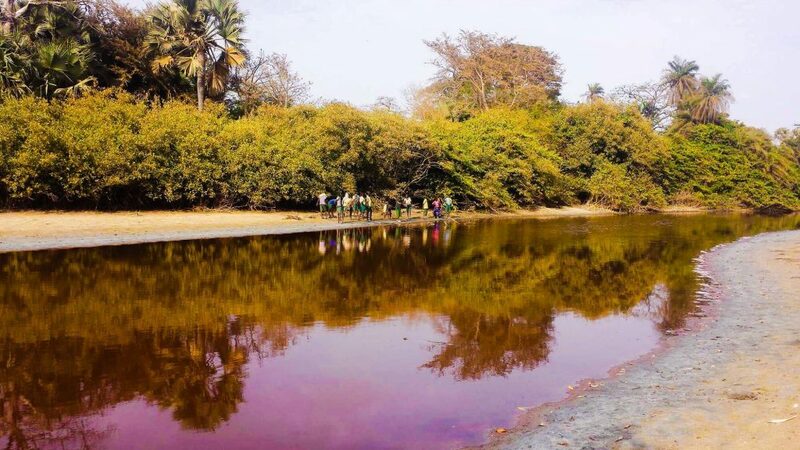 It is expected that the risks for cancer are increasing significantly since Golden Lead’s highly arsenic laden waste water is ending up in the food chain of Gambians. Goats drink this water, the fish local people eat is swimming in this water. Some people who have been swimming show skin infections now. These people have all reasons to be very worried. People are angry and started protesting against the fishmeal factories. Sadly they got arrested for raising their voice peacefully. This incident was feeding anger and frustation to Gambian youths. In the village Gunjur local activists decided to remove the piplelines themselves. The pipelines were placed illegal on their public beach. The youths got arrested and charged with 50.000 dollar. They were recently discharged. Since the factories started operating up till today, the government is turning the people living in the coastal communities a deaf ear. Corruption is still a problem with the new Gambian government. The Chinese factory owners are applying the strategy to bribe all the people they need to protect them. In the case of Gunjur village, elders are bribed, but also the local police and we strongly suspect Fisheries Minister Gomez is involved in this too. Still the Gambian government is allowing the factories to operate. This same ecocide is going on in Senegal, Mauritania and other African countries. How long will we wait for governments to act? African fishermen are not sitting back to wait what is going to happen, that’s for sure. If the EU & China continue to fish like they are doing today, they will end up in the hands of pirates tomorrow. Sooner or later, it’s going to happen.